As one of the country’s most respected stand-up performers, Jon Santos has always been top of mind when it comes to hilarious impersonations of popular personalities in showbiz and politics. 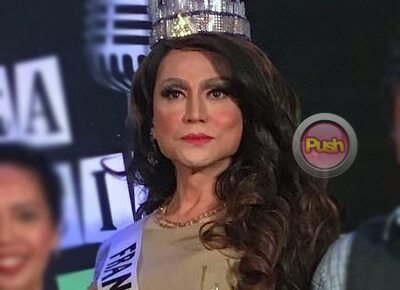 This year, Jon has decided to channel the recently crowned Miss Universe Iris Mittenaere in the one-night only show Extra Judicial Kidding on February 15. “I am excited to share the stage with Kakai (Bautista) who I was with in Rak of Aegis and I was with Rex Navarette in a special corporate project with the CCP and a couple of cities in America,” he said. Having been in showbiz for almost two decades now, Jon said he makes it a point to always be ready whenever he is on stage. "I have always made sure that I prepare 200% so yung half-baked is 100%. So it helps that I’ve always been in good hands, that the challenge has always been to sticking to one hour and a half or sticking to two hours instead of stretching. It’s nice that I have worked with two really loving writing buddies through the years. You have to work with a team you trust. The more I can assure myself that there are these two writing buddies and a good director, the more I can focus on spreading my wings and being this character I need to inhabit. When I am in that character, unless the character is deliberately at a loss for words, there will always be something to say in that heart of who I inhabit. I love disappearing another character,” he explained. If there was some important advice he could share to the next generation of performers who want to be like him, Jon said they should never stop learning new things. "Keep watching. There is no shortage of comedy on television, on print, online, DVDs, in film, on the concert stage, in the comedy clubs. Find out what you like as the customer and then you will have a nice idea of what you would like to give when it’s your turn. And always watch with a critical eye so you know what works or doesn’t work or what is a miscalculation, or what was a gem and why,” he shared. After getting married in Toronto, Canada in 2005 to his Italian-American husband West Stewart, Jon shared the secret to their long-lasting relationship. "Respect. Love and respect and separate bathrooms (laughs). Walang magpapahintay sa banyo. Honestly, laughter talaga. From day one in fact nag-agree kami that there should always be laughter. Pag sumuko ka dun, mas magiging stress ang buhay. Laughter really is one of the secret weapons,” he admitted. Every Valentine’s day, Jon said he is used to be busy working instead of celebrating as most couples do. "Nasanay na ang asawa ko na we work on holidays. Nung panahon ng noontime show television days, there was always work on New Year’s day and Christmas day and it was a working day for us. So over the years, West and I have figured out na we belong to the audience on these holidays and it is to be shared with them. After all the other 364 days of the year is still Valentine’s. It’s always Valentine’s,” he added. Watch Jon Santos, Kakai Bautista, and Rex Navarette in Extra Judicial Kidding on February 15, Wednesday at the Newport Performing Arts theater in Resorts World Manila. Extra Judicial Kidding is presented by Resorts World Manila in cooperation with Ultimate Shows, Inc., written by Rody Vera and directed by Joaquin Pedro Valdes. For tickets, call Ticket World at 891-9999 or Resorts World Manila Box Office at 908-8000 local 7700.